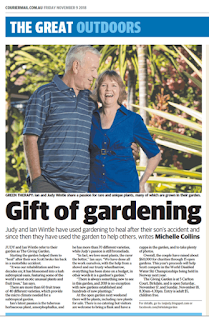 A one acre Sub Tropical garden situated just east of Brisbane. We have opened our garden to the public for 14 years. We open in November to aid a specific charity. On this weekend get a lot of pleasure meeting fellow gardeners. 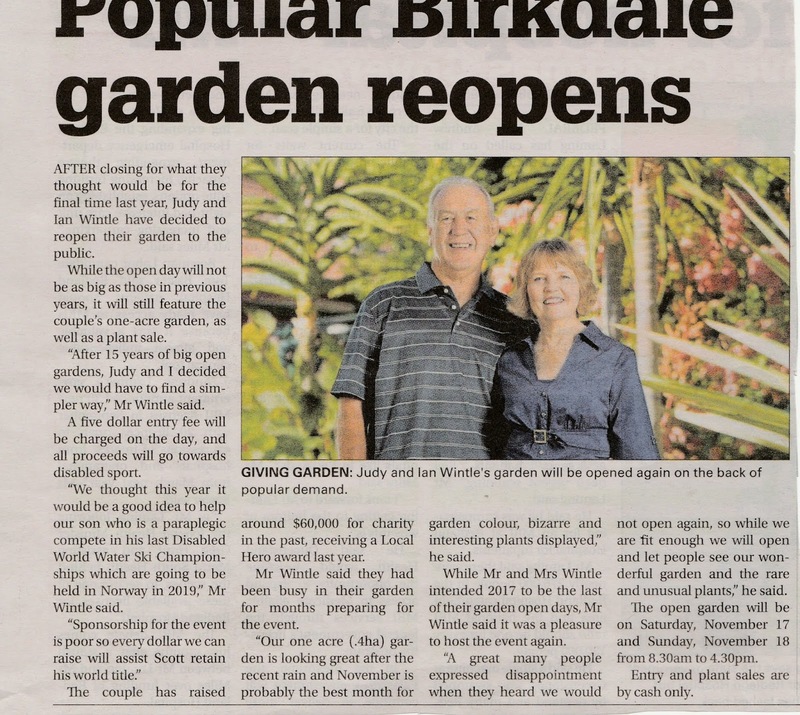 Judy sells many rare plants and this helps us to do more projects and buy more plants. 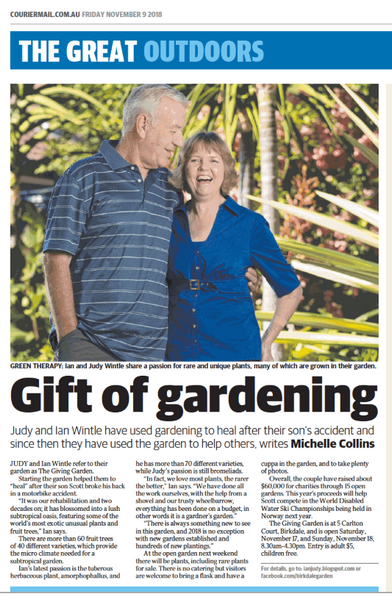 Judy and I are 'plants-people'and cannot resist buying something rare that we do not have. It has been very hard gardening as we seem to be in a severe drought most years. After the hottest and driest summer, I have ever gone through it has been such a relief to of had some good rain. We had around the 120 mills in total during March and thank goodness the temperature has finally gone into the 20s. Basically, every day during summer at the end of the day I was soaked in sweat and had to leave my work clothes outside as they smelled so much of sweat. No matter how hot it was I still worked every day in the garden making both big and small improvements. Aroids are gaining in popularity, so here are some of ours. Several trailer loads of rocks and soil and new plant plus two new shade areas have made the garden more interesting and an draw-card for this year’s ‘Open Garden’. Wow our 'Condom Plant has flowered. 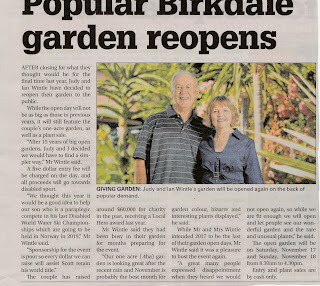 We had bus trips from Mt Tamborine and Caloundra Garden Clubs which were great always nice people and keen gardeners who loved our garden. It's a small world a lady from 'Caloundra garden club' had an English accent and I asked her where she was from, and it was not far from where I lived as a child, I then asked her what school she went to and lo and behold it was "Haslucks Green Primary School' same as me, we are the same age and were possibly in the same class. I have started preparing a new garden presentation starting with Aroid family followed by colour in the garden red, yellow ect. Amazing just how many red flowering plants we have. Still have plenty of visitors of the feathered variety. I have decided to name the presentation 'Aroids, Orchids and Colour in the Giving Garden'. After the rain it is amazing just how quickly the garden has sprung back to life, there are still quite a few bare patches on the lawn where the grass has died but hopefully that will come back, otherwise everything is looking very healthy. Sorry but NO update for February. The reason is the temperature in the shade here for the whole month has been in the mid to high 30s Celsius and that's in the shade. So, the garden has been basking in scorching conditions without a drop of rain. It has been the hottest and driest summer I can remember and it has been a monumental struggle to keep most of our plants alive. All out seven tanks are now empty. I did not publish a blog for December as that month turned out to be a rest from gardening as we had worked very hard to open our November ‘Open Garden’ and left us ‘gardened out’. Also, Christmas is a family affair and we had grandchildren to look after and of course everything else that goes with a family Christmas. Some nice orchids out which do not seem to be affected by the heat. December was completely dry and for the most part HOT, not a good time for gardening. January, well it has been an absolute disaster with only a small shower which dried up with the strong winds that followed with 30c plus temperatures every day with no respite for the whole month. We did get a good bunch of bananas off our sugar banana. It is so bad, much worse for the garden than the drought of 2009 where all the politicians panicked and built pipelines to nowhere, dams not hooked up to pipes, waste water that no one wants to use and a desalination plant that is rusting away, not to forget the travesty of Traveston Dam where the Queensland Government went ahead and bought all the land for untold millions then realized they did not have to OK from the Federal government and had to resell the land at an incredible loss. Politicians are a useless breed, for the most part afraid to make a decision and when they do it’s usually the wrong one. A prime example is the $50 billion submarine program we are buying from the French, atomic subs converted to diesel by 2050, what a joke. Sorry about my rant but sometimes I despair for this wonderful country. The cost of all these failures can be counted in the billions and who is paying for it, you the taxpayer of course. I bought a ‘Power Planter’, not the one advertised but from Trade Tools, much more cheaper and yes it is a good tool. Even with the heat I have still I managed to get three projects finished, photos below. The dry has really affected two of our Custard Apple trees and they are slowly dying, so I have had to create a shaded are for the under-story, not a job I really wanted to do but the plants are getting burnt in this long heatwave. Every spare bit of shade cloth has been used somewhere in the garden as it is so hot that even our water hoses are melting. We are hosting a meeting in February for ‘The International Cordyline Society’, hope we get some rain before then. What a busy month was November with our 17th consecutive ‘Open Garden’. 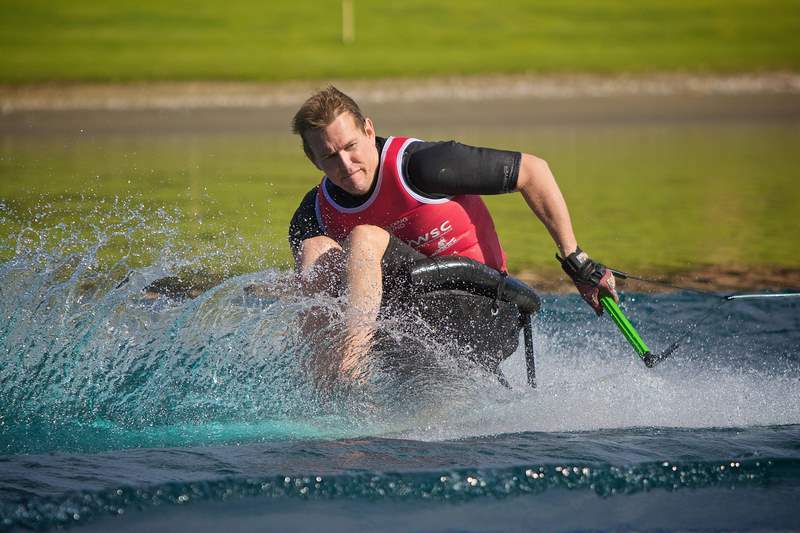 We really thought last year was going to be our last but Scott needed some help to get to Norway next year to compete in the ‘World Disabled Water Ski Championships’. We let Scott keep all the gate takings plus there was a donation box. 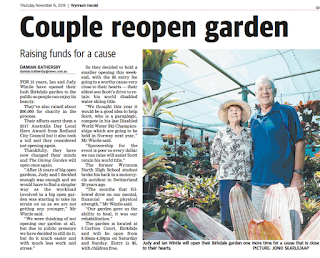 585 people came on the weekend and as usual the plant buyers were queued up at 8am. What a morning, we were rushed off our feet and thanks to our helpers who we could not of done without. 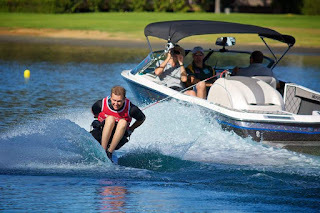 Will we open next year? That is the question. Probably, it’s a heck of a lot of work and the elements are usually against us but we enjoy the weekend and we get to help someone in need. So, if our health holds up YES we will open again in November 2019. The garden was still quite dry as we had no rain since mid-October and only a few mills since. The Black Sapote crop was quite small compared to other years but they were quite a size. Still the garden looked terrific and everyone who came enjoyed it and that’s what it is all about, sharing our love of plants and gardening with others. We had good support from the local newspapers. On the Wednesday prior to the opening I had a call for help from ‘Bayside Garden Club’ whose guest speaker was unavailable and asked if I could do it, so off I went and gave the ‘Garden Journey’ presentation. I am now working on a new presentation ‘Fantastic flowers and Foliage’, done about 70 pictures of Aroids so far but really need a rainy day to do more. So much time spent standing watering the garden, it’s a job I really hate but one that has to be done if I want to keep my plants alive. My Amorphophallus collection was quite slow to come up this year, probably due to the cool spring.